The East London Hotel is in one of the coolest parts of the capital. This area of the city is known as the hipster part of town, which means there’s always something going on. Expect plenty of chic no-chain coffee shops, contemporary art exhibitions in dimly-lit warehouses, and ultra-trendy fusion dining concepts. It’s a fitting backdrop then for The East London Hotel. Located around 2 minutes from Bethnal Green tube station, you’re a stone’s throw from the heart of the action. If you do want to travel to central London, it’s only 13 minutes by tube. 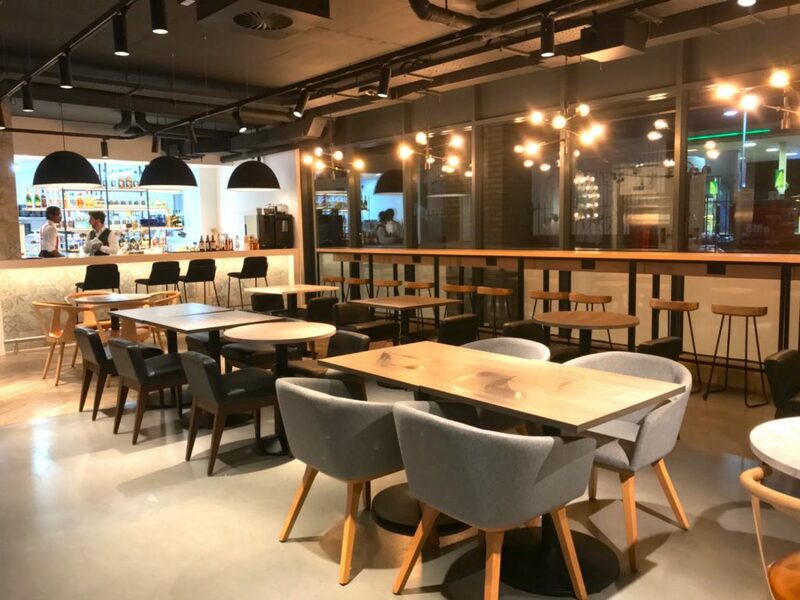 The location’s also ideal if traveling from Stansted Airport, as Stansted Express from Liverpool Street Station is 1 stop away. Being in the heart of trendy town doesn’t mean you have to follow suit. 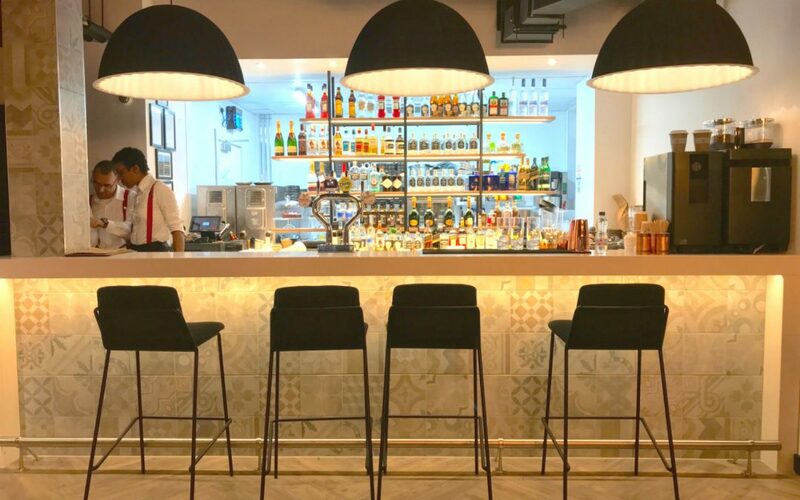 The East London Hotel’s open to everyone, hip or not, but it’s its interiors that will entice all types of travelers. There are 161 modern guest rooms in total. The range includes twin rooms, premium double, and standard double rooms. For families, or a large group of friends, the interconnecting rooms are ideal. British company Millbrook hand-make all of the beds, boasting premium mattresses and beddings. The company has created a special mattress just for them, called The East London Hotel 1000 Plus. It consists of 1,000 hand-nested pocket springs filled with 6 layers of Hampshire lamb’s wool, cashmere, silk and soft cotton. What’s more, if you love the bed that much, you can take it home with you! 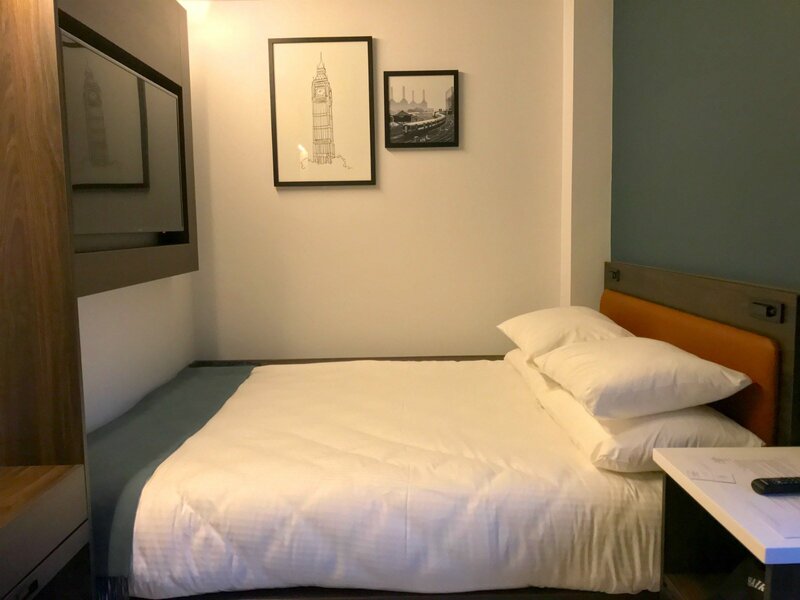 You can buy the East London Hotel 1000 Plus Mattress in a variety of standard and non-standard sizes. Bathrooms include my favourite type of shower — monsoon style — with toiletries from Rituals to leave you feeling invigorated and refreshed. Each room has free super-fast Wi-Fi; ideal for business travelers and restless teens alike, and Nespresso coffee machines. 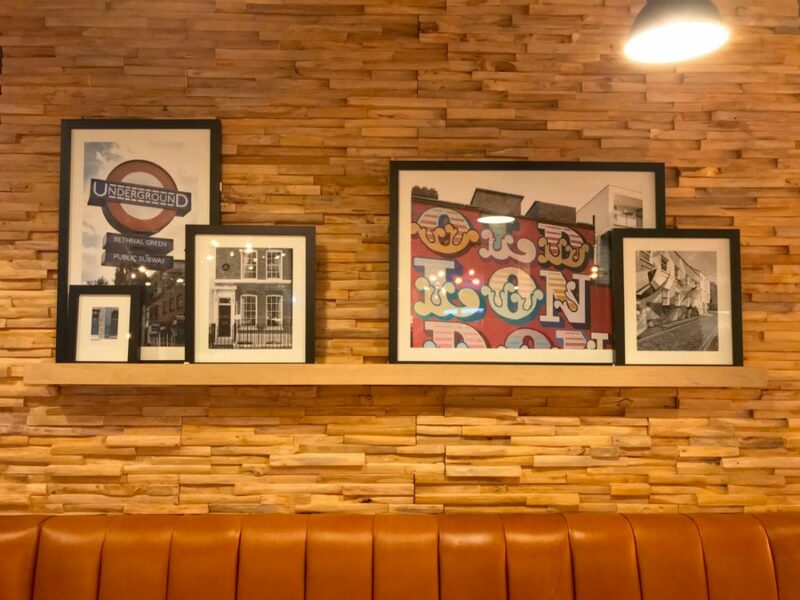 All rooms feature original artwork showcasing life and iconic landmarks around east London. If it’s your first-time in east London, you may want to discover the area from those who know it best. Booking a guided walking tour is the best way to see the places that only the locals know about. One feature I especially like about the hotel is its self check-in feature. So, whether you arrive at 2pm or 2am, you’re in complete control of your booking. Other noteworthy room features include an easy-to-use air conditioning system, a 43” Smart TV, and a safe. The standard double has a useful under-bed storage to keep all luggage out of the way. I also appreciated the multiple charging points in the room; ideal if you have more than one smart device. Breakfast is served in the restaurant / bar area from 7am to 11am. It includes one large, hot item, like my bagel with eggs and bacon, one smaller item (pastry), and a beverage. They source everything locally, like the delicious breakfast bagels, and only use seasonal ingredients. The hotel works with reputable local suppliers, meaning you get to taste produce from the real east end of London. Its restaurant is open all day, and serves everything from sandwiches and salads, to juices and smoothies. What are your thoughts on The East London Hotel? Is it somewhere you’d like to stay in London? Drop me a comment; I’d love to read your feedback. Disclosure: Though I was invited by The East London Hotel, all views expressed are my own. This post may contain affiliate links, which means I may receive a commission if you click a link and purchase something that I’ve recommended. Thank you for your support. I can’t believe how much London has changed since I lived there. There was a time I would never even have considered staying in East London especially Bethnal Green but this place looks great and I’ve been hearing really good reports about the area. Thanks for posting this, definitely worth considering for my next trip to London. I have never been to London but it is on my bucket list! This looks like such an amazing place to stay and I love the check in feature!! 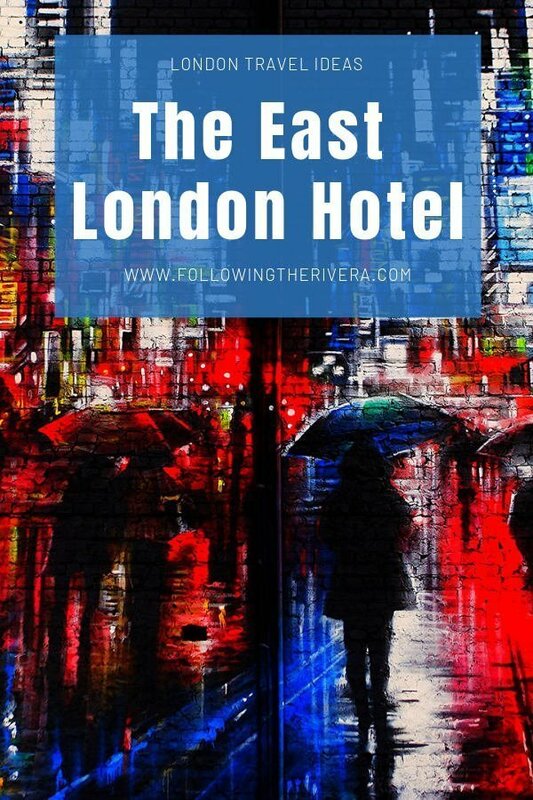 Have been to London a few times but never considered staying in East London Hotel. Loved the idea of self check-in feature they offer.. just makes it easy and quick. And that breakfast! Looks yum. 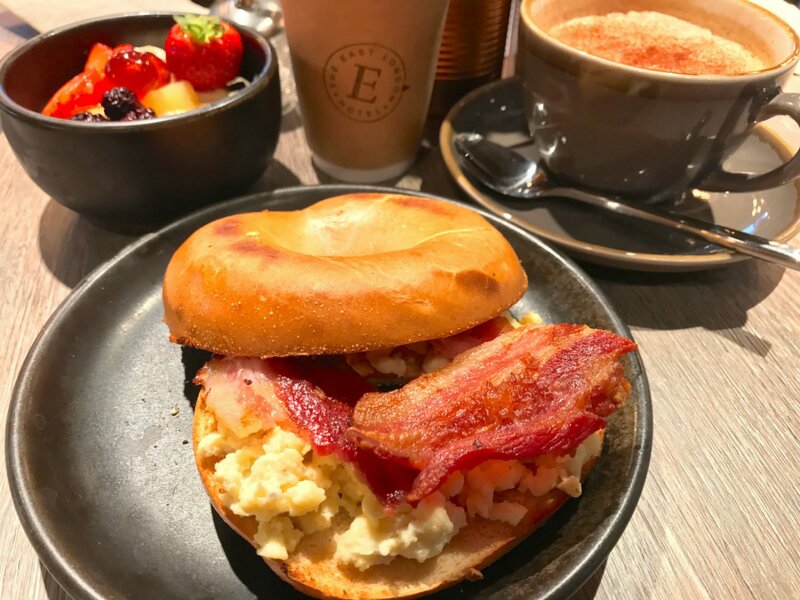 Bagels are the favorites and the look of it with eggs and bacon, just too inviting! Thanks for introducing a new accommodation option. Its a plus that it is close to the tube station too. Whoa! The hotel, your review, the precious pictures are a combination of awesomeness. Loved reading it. This place looks so cool! The showers sound heavenly and I NEED that bacon in my life right now! Lol it was very good, and crispy too! 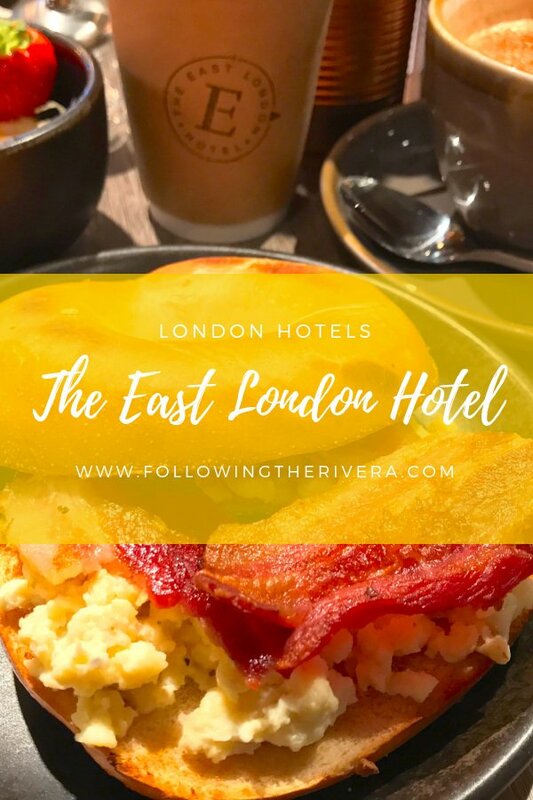 I’m back in London at least a couple of times a year and I’ll definitely check out the East London Hotel! I mean, super comfy beds, Rituals toiletries, Nespresso coffee machines…. amazing!! It’s a modern, yet cosy stay! Wonderful, it’s a fun hotel! 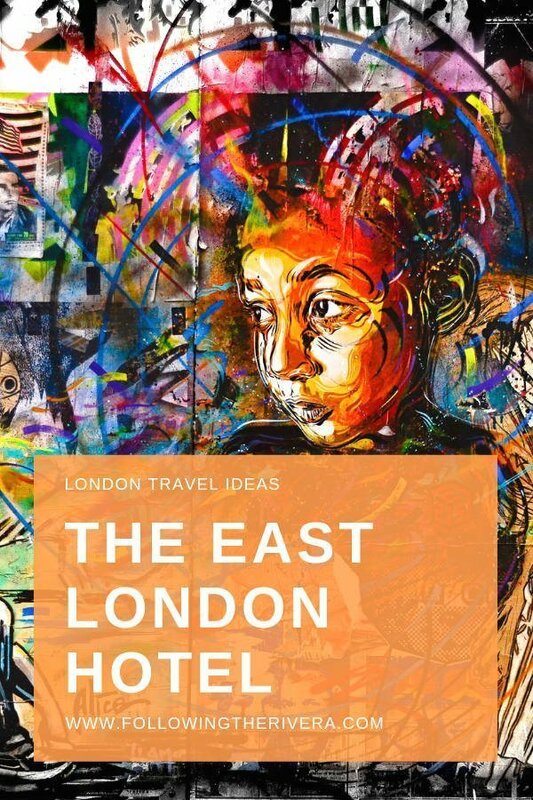 The East London Hotel sounds suitable for a lot of different travelers. Not only is the location great but I’ve never seen a self-check in option! And I’ll group myself with the teenagers and business people who appreciate fast WiFi – got to stay up on my SM! And any hotel that has a comfy mattress named after them is a hit in my book! This hotel looks gorgeous, and what a great check-in feature! I only realised today that despite growing up in Wales, I don’t think I’ve ever stayed overnight in London! I’ll definitely need to check out the East London Hotel as and when I do make an overnight stay. I like this kind of cozy places without the too much fancy stuff. Another advantage is that the tube station is so close to it. I really like the self-check-in and the breakfast look yum. LOVE that you can buy the mattress! I’ve slept in several hotels that were so comfortable I always wanted to buy the same mattress but couldn’t. Such a clean, modern looking hotel with plenty of places to work or just chill out comfortably. Also love that the food is locally sourced. A huge plus! Honestly, it was so comfortable, we wanted to buy it! It’s very clean, modern, and just opened! I love the look of this hotel, I’ve just checked their website as well. thanks for the reco. I often travel to London and will stay there next time. I love how modern and cozy this hotel looks. I haven’t been to a hotel yet with self-check-in so that was interesting! I wonder if other hotels will start to do this. That’s a really beautiful hotel. I love the atmosphere. It’s posh but still inviting. This looks like such a nice hotel in a wonderful location! London is such a fabulous city and this looks like the perfect place to stay for a few days. Your pictures are unreal! I will definitely consider this hotel next time I am in London, looks an amazing place to stay! The location of this hotel in London sounds perfect! I am a big fan of Rituals, so nice to know the hotel offers free toiletries from this brand. The breakfast looks delicious. Will definitely keep this place in mind while travelling again to London. Oooooo this looks like one fabulous hotel! If I’m ever in London, I know where I’m staying! We are planning a trip to London in the next year. I cannot wait to go to this area. It looks just like what we want! So pretty! Looks like you found a great hotel. I would love to visit London someday. This hotel looks really nice! I work in hospitality and I am always very interested in hotels. The self check in looks really interesting. I would love to try that out one day, haha. Also so cool you can buy the mattress! Looks great! I feel like I need to visit London again soon – this city is stalking me online. That looks like a nice place to stay, their amenities are so beautiful and the rooms look really comfortable and relaxing. Love the look of the hotel. And the thing about the mattress is interesting – I used to wonder many a time where I could purchase mattresses similar to the ones used in luxury hotels. So, its good to know that the East London Hotel came up with this idea. It’s something I’ve actually never seen before, but we were so tempted to take one! Perfect! You’ll love this area, it’s very hip! Thats a very inviting and cozy hotel that I see here. I fully agree, Lisa – the location is one f the most important aspects when it comes to choosing a hotel. This part of London (East) is indeed a very cool place and what could be better to fall off your bed in the morning and be already in the district and place to be? The monsoon style of the shower sounds also great, I love such little details, they make the difference. And yes, super fast wifi is also a must have for me when it comes to stay in a Hotel. So yes, looks and sounds like the perfect place to stay! This hotel looks so magical! Thanks for your recommendation! It definitely looks like a nice place. The self check in/out options is very handy especially if you are arriving super early in the morning or super late at night. Also, can’t beat the breakfast! I love East London. You’ll regularly find me wandering around Shoreditch and it’s always good to know about different hotels in the area. The thing I love the most is the self check-in. When I’m exhausted, I can’t handle or deal with people at all, so this is a massive tick for me. My judgement of a hotel is on a great bed! I just love a wonderful comfy bed! It’s great that you can buy the bed if you want to. I cannot wait to visit London. Thank you for this great review of the hotel. Ah you’re welcome! We loved the bed, wish we had bought it now! 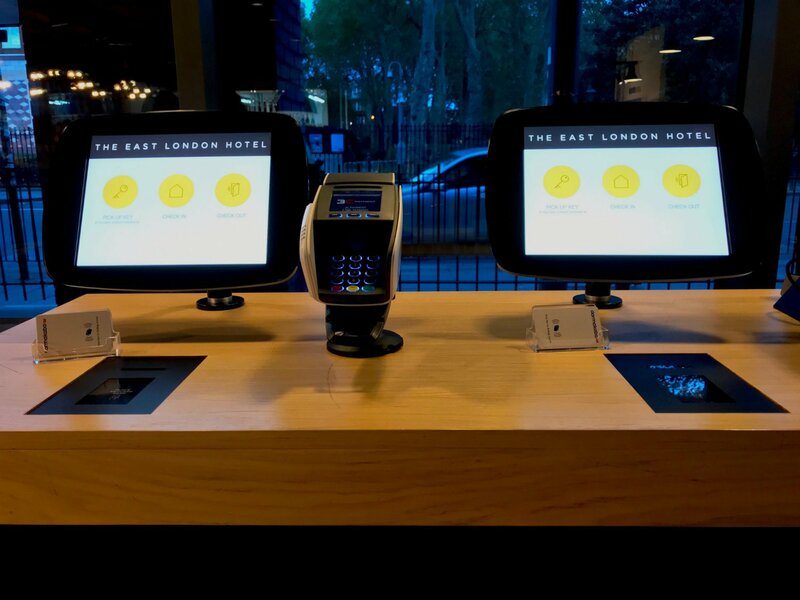 This looks like a great stop-over hotel and we like the idea of a self automated check-in. Rooms look comfortable too! Well the East London Hotel looks like it has been personalized to a whole different level. The premium bed mattresses are something which seem to be really unique, just for the hotel. Even I love monsoon showers, and it is great that the hotel has the same. I believe when I am heading to East London, I will consider this place for sure. Wonderful to know Shreya. You’ll really enjoy that monsoon shower! I would love a few night at that hotel. It looks really comfortable and beautiful! Aw you’re welcome Rosie! I’m glad to welcome you to the flashpacker club – we’re a nice bunch! I have never been there but definitely a nice hotel to stay and the place looks really welcoming. It’s very welcoming, yet independent at the same time! We stay in London quite a bit so I’m always looking for new hotel. The breakfast bagel looks extremely good. Perfect! I hope I’ve swayed you to consider the East London Hotel the next time you’re back! Wow what a swanky and modern decor hotel in East London. The automatic check in is surely ground breaking and just shows where technology is taking us. Love the modern look and the rooms look very clean and tidy. A great place to spend a few days on Lindon. I haven’t been to London in ages and this hotel sounds lovely for my next visit! I love English breakfast so much! Self check-in sounds like a great idea! How do you know when rooms have been cleaned? I also get excited when there are interesting showers at places I stay. Monsoon shower sounds like something I’d enjoy. I like the raining shower heads too! There’s actually a switch in the room, that you can turn on when you want it to be cleaned! Looks like a really stylish hotel. How’s the food? Often nice hotels let themselves done with their food because they know people are going to be there anyway. Hopefully, this place is doing something innovative in the restaurant because it looks awesome and it’s in a great location. This place looks chic and the lighting is so perfect.Self check in option seems to be a thoughtful one. Loved your captures! Food looks nice. Is it vegetarian friendly too? What’s a monsoon style shower? Anyways, the self-check in is so cool! I’ve never been to a hotel that has that kind of service! I’m actually planning a trip to London in January and this hotel looks so fabulous I might even stay here! I love the self-check in features and multiple charging points are key. The breakfast looks delicious and I’m so excited to try out all of the local coffee shops! Aw yay! I’m happy to read that! It’s still so new you can smell the fresh paint!